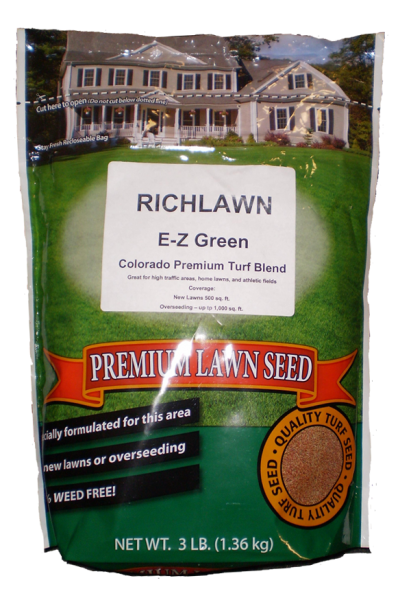 Richlawn EZ Green turf blend is a fast germinating, low maintenance mix of three exceptional cool season turf varieties that excel in Colorado’s semi-arid climate. As an added feature, this blend is naturally resistant to insects and NRS (necrotic ring spot). On new turf areas, the addition of organic material (3-4 cubic yards per 1,000 sq ft) and tilling to a depth of 6″ will greatly enhance the ability of the turf to develop a thick root system, which will save water and the reduce the incidence of weeds. Overseeding Rate – 3lbs per 1,000 sq ft.